I live and work in Braunton, North Devon. 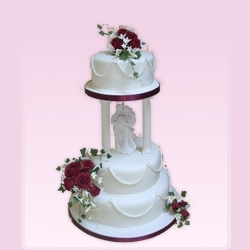 I have been a keen sugar crafter and cake maker for fifteen years, and have been established as a business for six. Many brides chose to get married in this part of the West Country as is it such a beautiful location with several recognised Areas of Outstanding Natural Beauty therefore I am close to some of the region’s finest hotels and beaches. 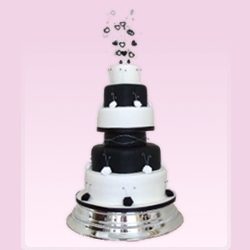 Choosing your wedding cake is an exciting and very important part of your wedding day as it will be the centrepiece of your reception. 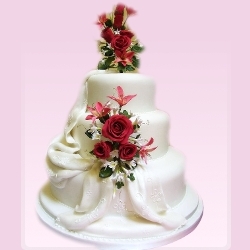 In our initial meeting I will discuss the type of cake you want (eg fruit, sponge, chocolate, carrot, or a mixture), the type of design you want, which ranges from classical to contemporary or novelty, (my extensive portfolio and large collection of wedding cake magazines are always on hand if needed. 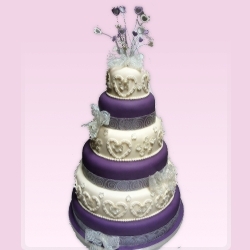 ), and the smaller parts of the cake such as cake shape, cake colour scheme, flower type and any personal writing you want to incorporate until both of us are satisfied. I am also prepared to meet my brides as many times as it takes for them to be comfortable and assured with their chosen cake. 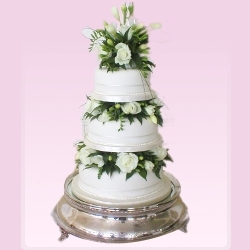 All of this together provides a personal and bespoke service that produces a beautiful cake as individual as you are, and does not stop until I am satisfied the cake is finished to my very high standards, and have personally delivered and set up the cake at your chosen venue, so that it's the best that it can be. If you would like to talk to me I will be very happy to talk to you and give you any advice regarding your cake, even if you are not sure you plan to use my services.